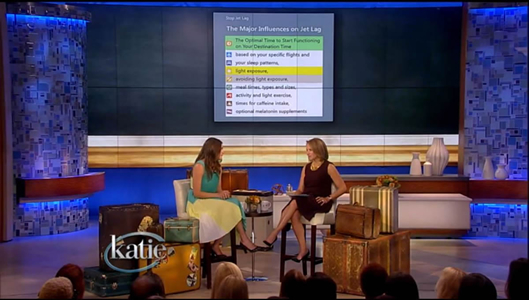 "How To Avoid Travel Mistakes – Jet Lag"
We were excited the other day to watch StopJetLag.com being featured by Sarah Spagnolo of Travel+Leisure on katie's Travel Toolkit. "Another mistake that can cause vacation turbulence is jet lag. But you say there’s an app for that." There’s a great service called StopJetLag.com. In fact, Travel+Leisure’s Trip Doctor recently attacked this problem because jet lag can really make a difference when you land in a destination." "It can kill a couple of days if you’re feeling really lousy." "StopJetLag.com will actually create a custom plan just for you. It’s $35. And they’ll send you a pdf. "I’m glad you said sunlight." "All of these things really do make a difference. So this is a big issue and something that Stop Jet Lag is a great resource for." "How To Avoid Travel Mistakes"